Murano was raised upon a system of islands joined by bridges and a Grand Canal runs through them like in Venice. Murano is famous all over the world for the artistic glass making of its glass-blower Masters, who usually open their ateliers’ doors to show their masterpieces and the numerous glass furnaces, that is why Murano is also called the “fires island”. Until the 18th century the ancient Murano was a place, rich in gardens, canals, churches (as many as 17! ), aristocratic residences, hospices and convents. Like Burano and Torcello, Amuranium, the ancient name of Murano, was one of the Venetian Lagoon centre, founded by Altino refugees, escaped from the Barbarian Invasions. At the beginning of the 19th century, many buildings were destroyed or damaged. After the economic recovery, due to the glassmaking, many new buildings were erected upon ancient gardens and many canals were filled in. Nowadays there are only three monumental churches (Santa Maria and Donato, San Pietro Martire, Santa Maria Degli Angeli), while the remains of some other churches, like Santa Chiara, San Maffio and San Stefano, are still visible. There are also the Oratory of San Giuseppe and Teresa with the nearby Briati Hospice. Among Murano palaces stand out Palazzo da Mula, with decorations dating back to the 13th-14th centuries, Palazzo Giustiniani, the ancient Torcello Bishops’ Seat and now the seat of the Glass Museum, and the Palladian Palazzo Trevisan. There is a Lighthouse in Murano, a cylindrical building made of Istrian Stone. Although its inner position compared to the sea, it lights up the port of Lido. During the Middle-Ages, the lighthouse was made of wood and its lit fires could light up the Venetian Lagoon. At the end of the 14th century Venice glass-factories (operating since the 11th century) were moved to Murano for safety reasons, as the atelier furnaces could provoke terrible fires in the Venetian houses, mainly built in wood. From that moment on Murano was famous all over the world for the glassmaking and became a holiday destination for artists and many noble families, that built here villas, palaces, churches and monasteries. According to the Republic of Venice, the moving of the glass factories from Venice to Muranohelped the Serenissima government to supervise the production better and to keep an eye on the glass-blower Masters, which could leave the island only with a special permission. You can get to Murano with ACTV public transport, either from Piazzale Roma or Fondamenta Nuove. Points of interest: Santa Maria and Donato Church, San Pietro Martire Church, Santa Maria Degli Angeli Church, Palazzo da Mula, Glass Museum, Lighthouse and Glass-factories. Burano is located in the heart of the Northern Venetian Lagoon. It was built on four islands, connected with seven bridges. 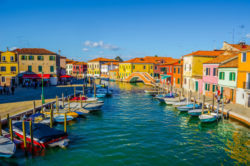 Furthermore, thanks to a new bridge, Burano was recently connected to Mazzorbo, made in turn of two interconnected islands. During the Barbarian Invasions (Goth first and Lombards later on), the mainland population, living in Oderzo and Altino, found refuge in the Northern Lagoon Islands in the 6th century. Then, when the towns were occupied by Lombards, the inhabitants of Altino moved the Bishop’s seat to Torcello, that became one of the most important island of the Lagoon, while Burano became a minor centre. However nowadays Burano is the most populated island of the Northern Venetian Lagoon. Burano is a fishermen village. Here boats are moored to the canals banks and fishing is Burano main business, yet here you can also find shipyards, where rowboats are still made. However, since the Renaissance Period, Burano is famous for lacemaking. Lace was used as furniture or women clothes decoration. At the beginning lacemaking was a simple diversion for noblewomen or nuns in Burano, then it became a real job for women. In 1872 a Lacemaking School was established in Burano. Now this school houses the Lace Museum. Today Burano is also famous for its colourful houses. As a matter of fact, every family paints its home with deep colours, to distinguish it from others and to recognise it from afar. 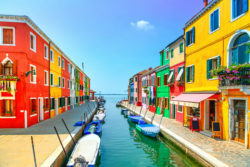 Burano is divided in five districts, connected by bridges: San Martino Destro, San Marino Sinistro, San Mauro, Giudecca and Terranova. The districts are separated by canals: Rio Ponticello, Rio Zuecca and Rio Terranova. Burano centre is Piazza Baldassare Galuppi (a famous musician of the 18th century, also called “Il Buranello”). The square was once a canal, now filled in. Here you can find San Martino Church and its adjacent Santa Barbara Oratory, which houses the most important art collection of Burano. Near the church the leaning Bell Tower of the 18th century stands out. In Piazza Galuppi there is also the Lace Museum, where you will see the very valuable lace collection and in the morning you will have the chance to observe from real life the lace techniques of lace makers. Points of interest: Piazza Baldassarre Galuppi, San Martino Church, Santa Barbara Oratory, Lace Museum, colourful hoses, old Fish market. Torcello is one of the Northern Venetian Lagoon island. It was an important town and a Bishop’s seat until the mid-17th century. Today only the remains of the old town show the important ancient past. The history of Torcello dated back to the Roman Period, when the island was probably the port of the ancient town of Altino. During the 7th century the inhabitants of Altino took refuge there and founded the famous Santa Maria Basilica in 639. Between the 7th and the 10th centuries, Torcello economy was based on trade, salt pans, metal, glass and wool factories. However, over the following centuries, the centralization of the economic business in Venice and the gradual turning of the lagoon into a swamp lead to the decadence of the island. 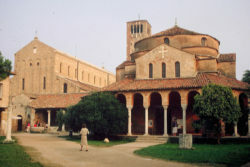 The flourishing past of the island is shown by few monuments: Santa Maria Assunta Cathedral, the ruins of the Baptistery and Santa Fosca Church; the ruins of San Giovanni Evangelista Monastery, Attila Throne, Palazzo del Consiglio, the Archives Palace, now seat of the Museum of Torcello, that houses many Roman, Byzantine and Medieval finds, discovered on the island. The Medieval and Modern Collection of the Museum includes Early Christian and Early Middle Ages finds, coming from Torcello and neighbouring islands. The Archaeological Collection includes finds coming from Veneto Region and the Venetian Lagoon, as well as a series of Egyptian Statuettes. The whole collection covers a period that goes from the Palaeolithic to the late Roman World. Hemingway loved staying at Locanda Cipriani, because here he relaxed and from here he started his hunts in the Lagoon around Torcello. Furthermore, here he wrote the novel “Across the River and Into the Trees”. Points of interest: Santa Maria Assunta Cathedral, Baptistery, Santa Fosca Church, Torcello Museum, Attila Throne and the Devil’s Bridge. You can reach and visit the islands directly from Sottomarina with Raffaello Navigazione boat tours or with ACTV Lines.